Yesterday when I picked Addi up from school, she regaled me with tales of the playground and painting. Then she said, “Tomorrow Mommy the leprechaun will come into my room and bite me in my sleep! I’m scared!” I convinced her that we would keep her safe and she spent the rest of the night saying she would be fine because leprechauns don’t have teeth and therefore couldn’t bite. This morning when we woke up the leprechaun had been to our house! 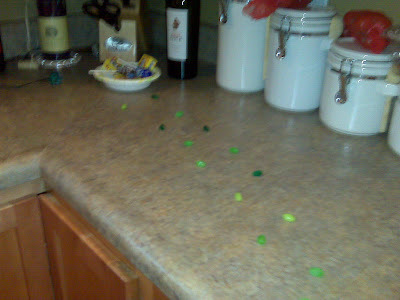 Green footprints down the counter led to a big bowl of candy. 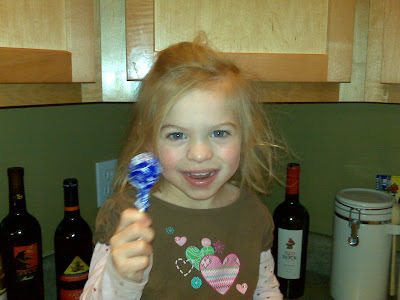 Addi was super excited about her candy. 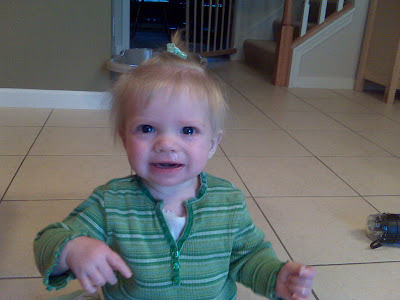 Sam got in on the act by wearing green (and even had a bit of green coming out of her nose). What that girl won't do for a holiday. Commitment, I tell you!